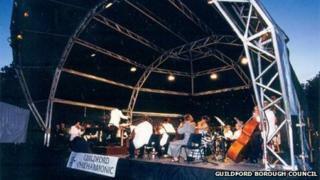 A professional symphony orchestra faces closure after a Surrey council decided to stop its £190,000 grant. The Guildford Philharmonic Orchestra costs 2% of council tax income, Guildford Borough Council said. Keith Motson from the Association of British Orchestras, said: "It's a tremendous shame for the heritage of orchestras in the UK." The council will award a grant of £60,000 to a new partner to provide classical music in the borough. The Guildford Philharmonic, made up of freelance players, has been funded by the council as part of its arts provision since the orchestra's inception in 1945 when it was the Guildford Municipal Orchestra. Mr Motson said: "It was a major orchestra for the area and had a tremendous history, working with top conductors including Vernon Handley. "We are disappointed that the council only looked at fully funding the orchestra or not funding it all." He said the orchestra had no plans after its current season. The council said an external partner would be appointed from April 2012 and £60,000 would be available to the successful bidder. Councillor Jen Powell said: "By making this change, we also aim to broaden the music on offer to local people. "We want to build on the current high standard of classical music by engaging with children and young people, adding world music and lunchtime recitals."